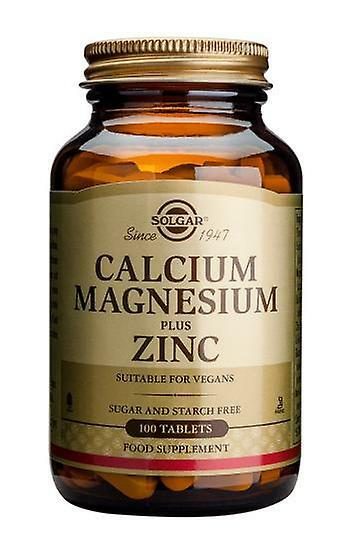 Solgar Calcium Magnesium Plus Zinc contain high quality Calcium, Magnesium and Zinc. Calcium provides the building blocks that help keep bones and teeth strong and healthy. It also supports the health of the colon, heart, musculoskeletal and nervous systems. Magnesium helps to regulate calcium transport and stimulates the secretion of calcitonin, a hormone that aids in the influx of calcium into bone. It plays an important role in protein formation and healthy muscle function. Solgar Calcium Magnesium Plus Zinc also contains Zinc, a trace mineral that plays a role in the synthesis of collagen in bone tissue. When combined with a healthy diet and physical activity, calcium may reduce the risk of osteoporosis. Tableted with: vegetable cellulose, titanium dioxide, citric acid, magnesium stearate, vegetable stearic acid, vegetable glycerin.